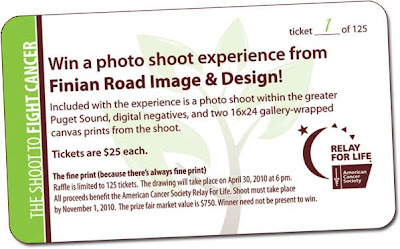 Finian Road Image & Design • The Blog: The 2010 Shoot to Fight Cancer is LIVE! The 2010 Shoot to Fight Cancer is LIVE! I introduce this year's fabulously awesome Shoot to Fight Cancer. 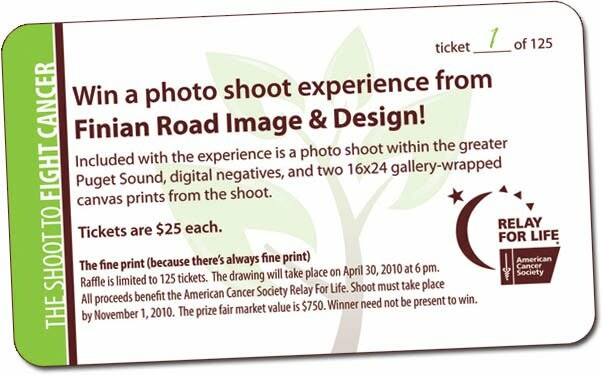 A photo shoot with your fam from Finian Road + the digital negatives + two incredibly beautiful gallery-wrapped canvas of your two favorite images from the shoot, all while fighting cancer at the same time? The newest addition to this prize are the two gallery-wrapped canvas. They are beautiful prints on canvas, wrapped around stretcher bars so the image continues over the edge and onto the sides of the canvas. They need no frame and are ready to hang! You will love them! Tickets are $25 each, and there are just 125 tickets available. Great odds for a prize package worth $750! Check out the beautiful shoot from last year's Shoot to Fight Cancer with winner Candice Iverson and her husband, Brian. Go to our online website for the Relay For Life.You'll see a very cute photo of the Wee Ski fighting cancer in camo. The drawing will be held on Friday, April 30th at 6:00 pm, Pacific time. The winner will be announced on the blog that evening, just after drawing! Remember, you can't win if you don't buy a ticket! Good luck!